The "DIAMONDS", GREAT & LITTLE, are just that. Gems in the waters of Casco Bay just a short ferry boat ride from downtown Portland - any time of the year. During low tide, Great Diamond and Little Diamond Island are connected by a land bridge. These island are best suited for summer living although about 25 people live on Great Diamond year-round. The year round population on Little Diamond is even less. There are no cars or stores on Little Diamond. One store open in the summer on Great Diamond. 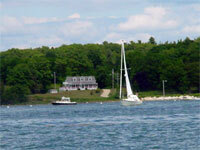 They are an oasis of quaint cottages enjoyed by those who treasure their privacy amidst the beauty of a Maine Island. It's no more complicated than that! D iamond Cove, on Great Diamond Island, has attracted artists and vacationers for more than 200 years. Notable visitors included Henry Wadsworth Longfellow and Harriet Beecher Stowe. By the turn of the century, Diamond Cove had been transformed into a U.S. Army stronghold. The heart of Diamond Cove is Fort McKinley, designed to defend Portland Harbor during the Spanish-American War. Built between 1891 and 1907, Fort McKinley housed more than 1,000 soldiers in brick barracks and Queen Anne-style officers’ quarters surrounding a stately parade ground. The fort was retired from active service in 1945. After decades of neglect, the fort has been restored to its original elegance. Barracks and officers’ quarters have become gracious homes with slate roofs, wooden porches, grand staircases and fireplaces. The former Quartermaster's storehouse is a fine restaurant; the wagon shed is an art gallery. Diamond Cove is listed in the National Register of Historic Places, and every effort is made to preserve its architectural integrity.